The Minnesota Twins haven't been at .500 or above since April 22nd. Will they get back there before the season ends? 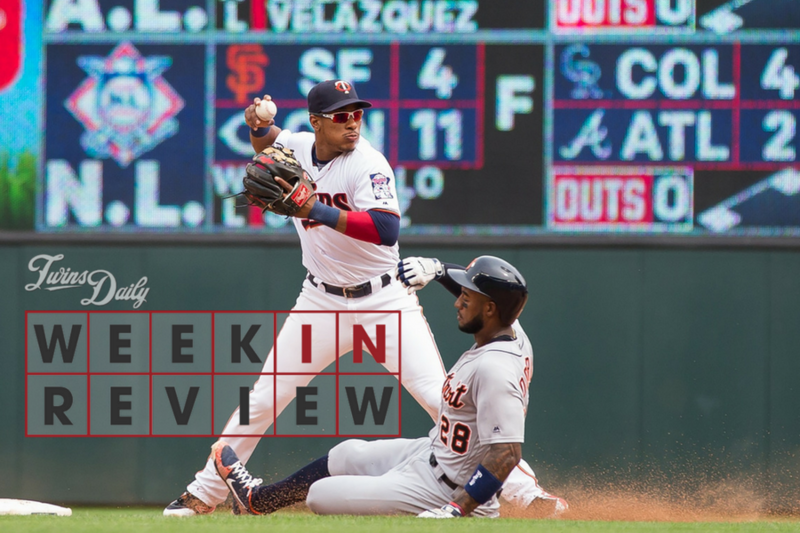 They are running out of time with less than a quarter of the schedule remaining, but they made inroads with a strong week at Target Field that saw the Twins hit their stride – emphasis on hit. It's been awhile since we've had a noteworthy Joe Mauer highlight to celebrate, which speaks to his generally disappointing production this summer, but that didn't make last week's big moment feel any less special. Called upon as a pinch-hitter Friday night with the Twins trailing by a run in the seventh, Mauer got a hold of one and drove it over the wall in right-center, propelling Minnesota to victory. Even in his greatly diminished state, Mauer remains a genuinely trustworthy player in key spots. He's not the best hitter on the team but I'll still take him over anyone else with a crucial run 90 or 180 feet away. If this is the end of the road for him (more on that in a bit), that's definitely something I'll always remember about the latest stage of his career. Mauer added another home run in his first at-bat on Saturday, nearly matching his previous season total (3) in a week that saw him go 8-for-21 (.381) overall. Although he has moved around in Paul Molitor's lineups a little, last week Jorge Polanco batted third in every game, and sure looked like a No. 3 hitter, driving in eight runs in six games. He flashed some nice pop with three doubles and a big home run. There were several other big contributors in an outstanding week for the offense, which produced 41 runs in six games. Miguel Sano sustained his invigorating re-emergence, launching three home runs and a double while driving in six. Logan Forsythe tallied five hits in Thursday's 15-run explosion and is batting .361 since joining the team at the end of July. Tyler Austin went 8-for-16 with two homers. Eddie Rosario collected hits in every game, and delivered the decisive dinger on Sunday afternoon. In the bullpen, Trevor Hildenberger rebounded from a run of bad outings, converting all three save chances in his first full week as closer. But it's Taylor Rogers who now stands out as the leader and stalwart of this bullpen. He's been pretty much spotless in August, and kept it rolling last week with four scoreless appearances. Fresh off his misguided "front office gave up on us" grumblings, Ervin Santana took the hill and contributed another clunker. Despite being staked to eight early runs on Thursday night, Santana made things interesting by serving meatballs to Detroit's meager lineup, coughing up seven runs over four innings. In five starts since rejoining the Twins rotation, Santana has an 8.03 ERA and 4% swinging strike rate, with his fastball rarely reaching the 90s. Astonishingly, he has surrendered nine home runs in 24 2/3 innings. Clearly not close to 100%, and showing no meaningful progress, Santana was shut down again following his latest outing. It's unlikely we'll see him on the mound again this season, and that's for the best. The Twins gain far more benefit from giving those starts to others going forward. One very deserving candidate will finally get his chance on Monday, jumping into Santana's vacant spot. We'll cover this excellent news shortly. Jose Berrios endured his own struggles on Wednesday against Pittsburgh. It was the third time in his past four turns he's failed to complete the fifth inning, and on this occasion he couldn't even get through four. The right-hander's control, so sharp for much of the first half, has gradually deteriorated – in his first 13 starts he issued 14 walks in 83 2/3 innings (1.5 BB/9), while in the latter 12 he's issued 30 in 70 innings (4.3 BB/9). Speaking of shaky control, Kohl Stewart was plagued by it in his second MLB start, which lasted only 2 2/3 innings on Saturday. He threw just 31 of 65 pitches for strikes, and issued four walks, showing poor command while failing to replicate the grounder-heavy contact mix from his debut. I've said it before and I'll say it again: I'd love to see Stewart in relief before year's end. It's fairly evident the stuff doesn't play as a starter. But it'll all be moot if he can't stay in the zone. Mauer's big home run on Friday night was a nice moment, but it doesn't change the reality that he's having one of his worst seasons at age 35. One has to believe he's had conversations with the Twins about his future. Maybe they're happy to bring him back on a cheapish short-term deal. Mauer can still be helpful in some capacity. Then again, the new regime isn't really attached to him, and Mauer doesn't necessarily fit with the vision of a rebuilt winner for the future. It's hard to imagine him playing anywhere else, so if the front office is signaling lukewarm interest, perhaps Mauer will determine the time has come. If so, how would it be handled? The homegrown MVP has enjoyed one of the better careers in franchise history, one deserving of celebration. It's not exactly in Joe's nature to make himself the center of attention, but I'd hope he will facilitate a bit of a send-off if he decides to retire with time remaining in the season. The fans would really enjoy it and I'm sure the team's marketing department would too. Following Monday's makeup game against the White Sox, the Twins have three homestands remaining – a four-game set against Oakland next weekend, followed by a six-gamer in early September and seven games to wrap up year, with Ron Gardenhire and the Tigers on hand for the second-to-last series. The top three Twins pitching prospects are all trending up, and one is moving up. Brusdar Graterol and Stephen Gonsalves were already established as the cream of the system's crop, and reinforced their standings with big performances last week. On Wednesday, Graterol fired seven innings of one-run ball for the Miracle, scattering three hits and three walks while striking out six. In his last five starts he is 4-0 with a 2.37 ERA, and opponents are batting .196. The hard-throwing righty, who turns 20 next week, has wasted little time transferring his dominance from the Midwest League to the Florida State League. Meanwhile, Gonsalves took care of business yet again, and finally got his just reward. He tossed six shutout innings on Tuesday to extend a spectacular run in the International League, where he has allowed only nine runs on 34 hits in his past 64 innings. On Sunday, we learned that he'll be making his major-league debut on Monday against the White Sox. A brief Red Wings teammate after joining Gonsalves in Rochester roster last week, Lewis Thorpe solidified his case for being mentioned alongside him and Graterol. In his first Triple-A start on Wednesday, Thorpe threw 6 1/3 innings of three-run ball with no walks and nine strikeouts, inducing an eye-popping 22 swinging strikes. In his last 10 Double A starts before the promotion he'd posted a 2.09 ERA and 66-to-10 K/BB ratio in 52 innings with opponents slashing .178/.221/.259. Thorpe is a stud and given his presence on the 40-man roster I wouldn't be surprised if we see him in September alongside the newly promoted Gonsalves. Monday's game is the kind of exciting draw that keeps fans watching in a lost season. We've been waiting a long time to see Gonsalves on the big-league stage and now we'll finally get our chance after his magnificent stretch at Triple-A. It's a much-needed glimpse of the team's hopefully bright future. White Sox fans are surely feeling the same way about the next game, which will see Michael Kopech make his big-league debut against Minnesota. Ranked as the game's 13th-best prospect by Baseball America, Kopech has an incredible fastball that's sure to give Twins hitters fits, on Tuesday and well beyond. Finally we have Gonsalves, good or bad, he deserves this.We have a lot of questionable starters and it seems there is no faith in our minor league relievers so maybe we have Odorizzi and Stewart in the pen. Send down Field, bring up Wade.Move the pieces around until we have the team we want.Thanks Joe for a fun career - not great, but very good.Time to move on. And, by the way, Romero deserves to rejoin this rotation.Lets get next year in place. I still like Romero auditioning as a closer. Depth is nice, and I really like ours, but is it enough to withstand a Gibson and Odorizzi trade in the offseason??? No. With Erv not able to show anything to give us hope that he'll be back in 2019, expect both Gibson and Odorizzi in the rotation next year. Gibson as the #2, Odorizzi as the #4. The FO thinks we can contend next year (so do I), and they won't go with 3 unproven starters to start the season. Next year's rotation is almost already set - Berrios, Gibson, Pineda, Odorizzi, Romero/Gonsalves/Mejia. Gonsalves is up to show why it should be him. Personally, I could care less if we dealt Gibby and Odorizzi in the offseason, but the reason I ask is because it wouldn’t be all that suprising to see it happen. Besides Santana our rotation was pretty healthy this year. Next year? Who knows but typically there are multiple DL stints in the rotation that make pitchers 6 through 9 important. When it comes to pitching. You can never have enough. I'd love to see Stewart in relief before year's end. It's fairly evident the stuff doesn't play as a starter. "......The FO thinks we can contend next year......."
Who is "we" and "contend" for what? Where is the source that the Twins' FO thinks the Twins can contend (I guess for AL Central) next year? The Twins will have more unknowns heading into next year than they did this year and will be coming off a worse record than they did this year. I can't believe they would go out on such a limb unless it is purely the marketing department saying this. "Get your 2019 season tickets now while they last!" BTW, the upcoming Oakland series should be a good bench mark and the A's have gone about the business of winning baseball games now instead of always in the future. Mauer still leads the team in OBP and is 40 points better than league average.I haven't been as disappointed in his season and like him leading off. This lineup definitely was diminished when Mauer went on the DL. He might not be the best hitter on the team but he is still one of the best. I don't know why everyone is counting on Pineda, he's coming back from a major surgery.Plus Berrios has a lot to learn. They need every piece of depth that they can get!!! We could go so many different directions with this post. We better be contending next year. The FO botched the offseason but they get a mulligan. They have plenty of money to spend on player salary. By the way, Oakland was under .500 and pretty much out of the race not too long ago. I just don't want us to sign so-so FA.It never works out.We have a good farm system.If we're going to sign F.A. 's keep the years short and don't go all in. I agree with this.My point is that we need to have at least 3 proven starters to start the year and 4 would be much better. 3 is exactly what we have if Santana isn't back to his old self - Berrios, Gibson and Odorizzi. Pineda is the closest to a proven starter out of the remaining group, 8-4, 4.39, equivalent FIP for the Yankees in 2017 before he got hurt. Not bad, but certainly not more than a #3 or #4 starter.Getting back to the earlier comment, that means we can't afford to trade Odorizzi and we ABSOLUTELY cannot afford to trade Gibson. We should try to re-sign Gibson to a 3-4 year deal. I'd say 2 years but I doubt if he'd take that, he can bet on himself and do better after next year if he doesn't get hurt. Pineda - he'll get the first shot because he's got the MLB track record of middlling success and the talent. Santana - if re-signed and shows his finger issues are gone. Most likely somwhere else. Mejia - has shown enough to get a chance out of spring traininng if healthy. Romero/Gonsalves - both have the minor league track record, a lot depends on how Gonsalves does in the next 6 weeks. Stewart - AAA depth at this point but should stay on the 40 man. Thorpe - Maybe a mid-season call up if he dominates in AAA? Gets a look in ST. I absolutely think the FO thinks that the Twins (first quesstion) can contend for the Central (second question) next year. Couldn't disgaree more on unknowns. We now know after another year that we have a set OF 3 deep, 4 if Buxton can play at the MLB level, a solid, good hitting SS, a competent MLB 2B, 2 MLB caliber catchers when Castro comes back, a good Utility back up infielder, 3 solid MLB starters, 2 of whom are #2 or #3 buys, one is a solid, veteran #4 or #5,and at least 4 MLB quality guys in the BP, 5 if you count Reed. What are the unknowns? Is Sano what he's been since he's come back? If he is, add a competent to good 3B to the mix. WHo mans 1B? Mauer if he comes back - not great, but valuable. Agree that 1B is big hole without Mauer, unless we re-sign Escobar, put him at 3B and move over Sano. Austin looks interesting, but way too early to tell. Seems unlikely that Morrison will be back and not great for us if he is. On balance, this team could easily be an 83-85 win team next year as is, higher if we re-sign Escobar. Even better if we either sign a frontline starter (unlikely) or Berrios takes the next step forward and either Pineda or one of the young guys steps up to be a solid #3 in the rotation. We didn't trade away anyone that was going to help us next year, and Escobar and (maybe) Dozier are the only two we'd want back. I don't think anything the FO did threw in the towel on 2019 at all. In what sense did the FO "botch" the offseason? They compelled ownership to boost payroll beyond its comfort zone. They paid little for Lynn or Duke and got prospects back for them at the deadline. Odorizzi trade was fine. Reed and Morrison have been busts but hard to anticipate that. Those moves certainly don't constrict them going forward to the extent a Darvish signing. Bottom line is that nothing they did would've offset the massive decline from the Twins' internal core. Last year the combo of Erv/Buxton/Dozier/Sano produced 13.7 WAR, this year they have produced 0.7. Not sure how you can hold management accountable for that. Of the next 7 starters they are up against, 4 are touted 1st rounders and 2 are 2nd round guys. Fiers is a lowly 22nd round guy. They seemed to pull off an Oakland type off season finding players that teams might need during the season that they could flip if they were not in contention. The fact that they did end up getting some potential in the returns on the trades should be proof enough that the guys they grabbed were good pick-ups. I'm not ready to call the Reed signing a bust. He was good at the start of the season. I'm betting he's been playing hurt. Morrison signing seemed more hopeful. I did like it at the time though last I checked, I'm not paid fat stacks of Twins cash to me these decisions. I love these Week in Reviews! I’m not so sure Gibson’s going to get a big payday after next year, even if he does well. It might serve him to take what he can get now. Ask yourself how he stacks up with Lance Lynn, prior to this year. IMO roughly the same. One could argue Lynn was better. Gibson will be 1 1/2 years older after the 2019 season than Lynn was after 2017. I’m confused. Why would they trade or release Gibson? His arbitration number will be high, much well below a comparable salary for a free agent starter. I believe, despite years of doubt, that Gibson is a legit #3.
fwiw, Gibson ranks 11th in the AL for pitchers in terms of bWAR. I know there have been plenty of discussions about what exactly it means to be an ace, or a # 2, etc. Just throwing it out there. btw, the Indians have 4 in the top 10. Which really tells you how bad their bullpen has been because their offense is also one of the league’s best. I would classify Joe’s career as better than very good. Very close to hall of fame and close to greatness. Could be in Tony Olivia catagory.